Me and my friends decided to have Istanbul . We just look for a package and fortunately we found the excellent one . The EVRE TOUR travel agency managed all ,we don’t have stress ,everything was arranged in timely manner, Sir Şenol was very polite ,very accommodating ,and the most important thing was he’s always checking us if we are ok or not in every places we visited . Indeed , it was a wonderful marvelous tour that we had . We enjoyed a lot , the food , the hotel and the weather . Thanks to EVRE TOUR for your warm welcome to us .it was a great pleasure to meet you guys .For sure we will comeback after 2 months .Turkey is a nice place to visit guided by a good travel agency . Best Of Turkey; the package covers the best site to visit and discover for visitor. If you are first time comer and want to visit the sites which are MUST DO in Turkey, the Best of Turkey covers those sites which are Istanbul, Bosphorus, Old City, Cappadocia Goreme Open air museum, Under ground city, Ephesus Library, Artemis Temple, Virgin Mary House, Calcium Terraces in Pamukkale and Hierapolis Ancient City. 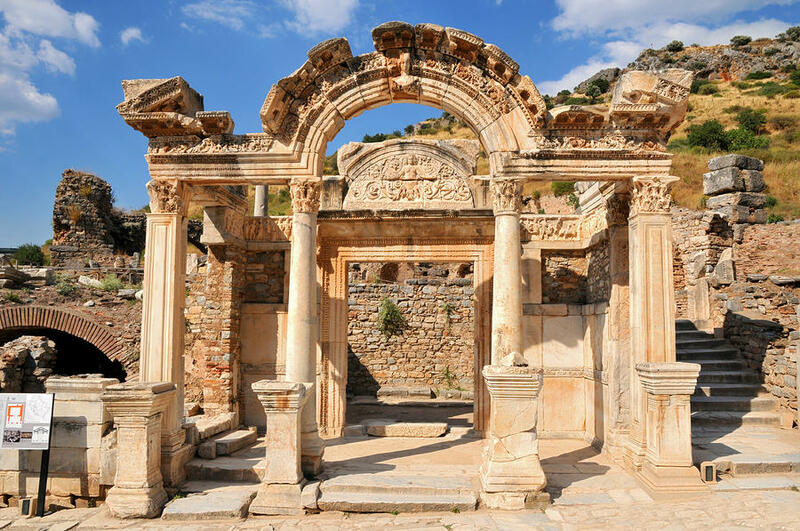 Visiting the Ephesus Ancient City and experience the Ancient world's art and history and life. Explore the Hierapolis ancient city and enjoy walking on Calcium terraces and experince the thearmal spring water. Day 1.: Arrival To Istanbul. : Transfer to Hotel. Check in Overnight in Istanbul. (No Meals). Day 2.: Istanbul. : Bosphorus And Two Continents Tour. Overnight in Istanbul. (Breakfast and Lunch). Day 3.: Istanbul To Kusaadasi Via. : Byzantine And Ottoman Relics Tour. Fly to Izmir. Overnight in Kusadasi. (Breakfast). Day 4.: Kusadasi To Ephesus. : Ephesus Tour. Overnight in Kusadasi. (Breakfast and Lunch). Day 5.: Kusadasi To Cappadocia Via. 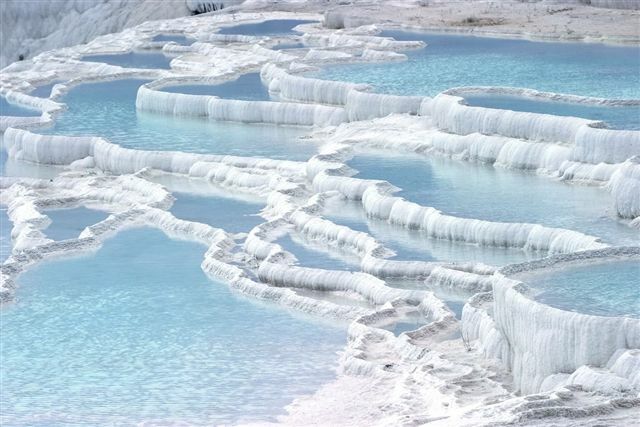 : Pamukkale Tour. Overnight bus to Cappadocia. (Breakfast and Lunch). Day 6.: Arrival In Cappadocia. : North Cappadocia Tour. Overnight in Cappadocia . (Breakfast & Lunch). Day 7.: Cappadocia To Istanbul. : South Cappadocia Tour. Fly to Istanbul. Overnight in Istanbul. (Breakfast & Lunch). Day 8.: Depart From Istanbul. : Check out from hotel. Transfer to Airport. (Breakfast). Day 1.: Arrival In Istanbul. : Transfer to Hotel. Check in Overnight in Istanbul. (No Meals). Overnight at the 4 Star Hotel in Istanbul. Day 2.: Istanbul. : Bosphorus Tour. Fly to Izmir. Overnight in Kusadasi. (Breakfast). 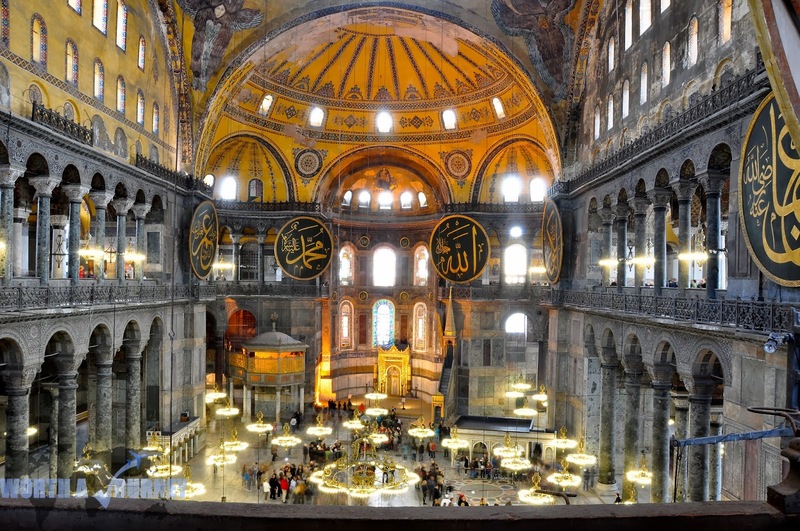 Visiting: Byzantine City Walls, Golden Horn, Spice Bazaar, Bosphorus Boat Cruise. Bosphorus Bridge, Beylerbeyi Palace, Çamlıca Hill. Day 3.: Istanbul To Kusadasi Via. : Byzantine And Ottoman Relics Tour. Overnight in Istanbul. (Breakfast and Lunch). Visiting: St. Sophia, Blue Mosque, Hippodrome, Topkapi Palace, Grand Bazaar, Byzantine Hippodrome, German Fountain, Egyptian Obelisks. 21:00 Fly From Istanbul to Izmir by available flight. Overnight at the 4 Star Hotel in Kusadasi. 16:00 PM At the end of the tour, continue to Kusadasi. Day 5.: Kusadasi To Pamukkale. : Pamukkale And Hierapolis Tour. Overnight Bus to Cappadocia. (Breakfast and Lunch). 08:30 AM Arrival to Pamukkale, Short Rest and continue to Pamukkale Tour. Visiting: the Hierapolis, Necropolis, Roman Baths, Domitian Gate, Latrina, Oil Factory, Frontinious Street, Agora, Byzantium Gate, Triton Fountain, Cathedral, Apollon Temple, Plutonium, Theater, Antique Pool, Calcium Terraces. 16:00 PM At the end of the tour, Free time in Pamukkale and transfer to bus station to continue to Cappadocia. ***** Flight option and is available instead of Overnight bus. 07:30 AM Arrival in Cappadocia and transfer to hotel. Overnight at the Recommended Cave style special class hotel in Cappadocia. or Overnight at the 4 star hotel in Cappadocia. See you next time in your holiday in Turkey. - 1 Nights Hotel Accommodation in Cappadocia. 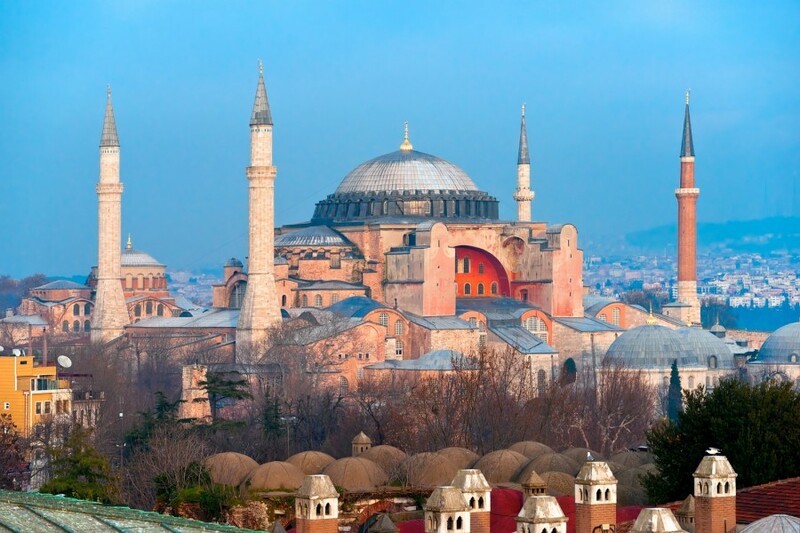 - Guided Istanbul Byzantine and Ottoman Relics Tour. - Guided Istanbul Bosphorus and Two Continents Tour. - Guided Pamukkale, Hierapolis and Calcium Terraces Tour. - Guided Ephesus Ancient City and Virgin Mary House Tour. - Guided North Cappadocia Tour. 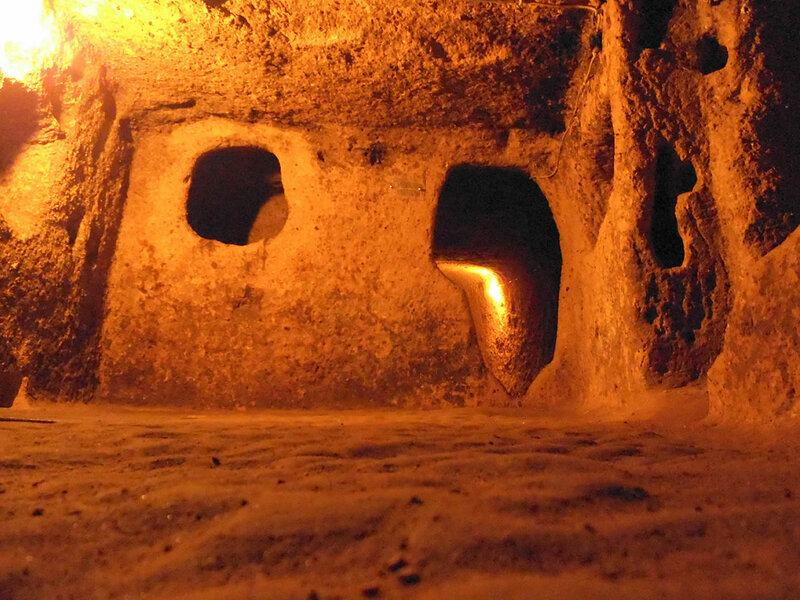 - Guided South Cappadocia Tour. - Museum, Monuments, Entrance, Ruins during the tours. - Lunch during the tours in an open buffet local restaurants. - Arrival and Departure Domistic airport transfers in Istanbul, Izmir, Cappadocia. - Flight Ticket from Istanbul to Izmir..
- Flight Ticket from Cappadocia to Istanbul. - Bus Ticket from Pamukkale to Cappadocia. Orka Royal Hotel or Dosso Dossi Old City or Antik Hotel or similar 4 star hotels. Ilayda Avangarde Hotel or Palm Hotel or Derici Hotel or similar 4 star hotels. - When guests booked the package included flight tickets, the flight tickets will be provided after booking. My wife and i we have been in Turkey and joined to the best of Turkey tour package which was 8 days but, we wanted to have 9 days and extended it 1 night and spent it in Istanbul. During the pacakge everything was excellent with pick up, drop off, guiding, friendly people, i will use their service when i will go to Turkey next time. Last week, we returned from Turkey with great memory and experiences, thanks to mr.senol; he is arranged our 8 day best of Turkey tour and made is enjoyable and memorible with the great arrangements included on time pickup service and transfer, The tour guides in each city were great, friendly and gave us informative experiences during our visiting and sightseeing in Istanbul, Cappadocia, Ephesus, Pamukkale. The hotels we used was four star in istanbul and kusadasi, the cappadocia one was cave, all they were with great location to reach to restaurants, small shops. At the end I want to say it was great service and worth for money. All the best and i will infrom my frieds and family to expand your Turkey Tour Service. Me and my family, we have spent great time in Turkey. Thanks for all your service and great holiday. I will recommend your 8 Day Best of Turkey Tour to all my friends. All the best. 8 Best day of Turkey with Bursa Tour. We had a great time spending short vacation in Turkey, we stayed for 9 days exploring Istanbul, Bosphorous, Bursa, Pamukkale, Ephesus and Cappadocia. Their nature and culture are fascinating. The people were friendly and hospitable. I’m so thankful to Mr. Senol who arranged our tour, it went well and smooth. The tour guides are great, you will not get bored during the tour. We really had fun. I wish I could visit Turkey again. 8 Day Best of Turkey Tour, we want to do this tour, we are a family and want to make it in 2019, please inform us about the details and price. "8 Day Best of Turkey Tour"
We have had great experiences, last week we had been in Turkey and made the 8 Day Best of Turkey Tour. Everything was great and well arranged. Thanks to Mr. Senol who arranged our love holiday in Turkey. 8 Day Best of Turkey Tour, me and my family we have spent great time in Turkey. We joined to the 8 Day Best of Turkey Tour, 6 of us. It was great and enjoyable, actually, it was kind of private tour, because the group was 11 in Cappadocia, 9 in Ephesus and Pamukkale and 15 in Istanbul. We were more then half of the most of the tours and more enjoyable. The 8 Day Best of Turkey Tour which we had done in Turkey and visit the best sites. Thanks to everyone who helped us to have such a beautiful holiday in Turkey. Especially, our tour operator mr. senol then tour guides in each city, I highly recommend to every one to go Turkey and join their organization of Best of Turkey Tour. It is possible to make all private it was more but, if you will be 8 to 10 people that will be great for you to make it private by paying some more and enjoy more. All the best. 8 Day Best of Turkey Tour, it is enjoyable and great to visit turkey. I highly recommend to everyone to go Turkey and discover this beautilful country, everything is excellent, locals are wonderful, likes to talk and they are helpful, the tour service were excellent. 8 Day Best of Turkey Tour, I want to have more information about this tour package. We had great time in Turkey. The 8 Day Best of Turkey Tour which will recommend to every and all my friends. Thanks. Best of Turkey Tour, great service and excellent places to discover in Turkey. Me and my family, we have had the best of turkey tour in Turkey which was excellent to discover the sites that we wanted to visit, we enjoyed everything. I want to thank to everyone especially, mr senol who arranged everything for us and organized all on time. I highly recommend this 8 days package to every body who is thinking or going to Turkey. All the best. Best of Turkey Tour, we are a couple and want to make the best of Turkey Tour for 8 or 9 days if possible, please inform us about the details and price. Best of Turkey Tour is the great way to discover Turkey and see the best place within a guided group tours. The Best of Turkey Tour package which we have done in Turkey. I highly recommend to everyone who is thinking to go Turkey. We had excellent time and experiences with the informative tour. We have been in Istanbul, Cappadocia, Ephesus, Pamukkale in Turkey. The organizing was excellent. Thanks to everyone. We enjoyed have had great time during the our 8 Day Best of Turkey Tours. It was well organized and informative tour service in Turkey. All the best. "8 Day Best of Turkey Tours"
The 8 Day Best of Turkey Tours which we have done is started when we arrived in Istanbul. The pasport and visa things took about one hour, than exit the airport and intered to the city. We picked up from airport and continue to our first day of 8 Day Best of Turkey Tours. It was interesting, we went to our hotel from the sea side and have got great view of the city. Hotel was excellent with its location and staff as well. I can say it was the best place to stay, it was in old city of Istanbul. Our second day was started with pick up service which was 5 minutes early (kept it waiting we were not ready). Then we continue to our firs day which was amazing. Istanbul is beautiful, we visited the historical sites of Topkapi Palace, Blue Mosque, Hagia Sophia Museum. It was a full day tour, the guide was knowledgable and friendly, the lunch worth enough for group tour. The return to hotel in the afternoon about 17:00 pm then it was our time. After taking shower and beeing ready to discover our own way and dinner. Old city of Istanbul, was excellent for this, there are lots of restaurant, cofee, sweet, tea and water-pipe (hookah), return home late in the evenning. (not too much late because, next day, we had tour). Today, We were ready and the company was 5 minutes late. Anyhow, 5 minutes is normal, because we joined to the group tour. We discovered the beautiful bosphorus, it was amazing, there was lots of things to explain for the bosphorus and the rest of the 8 Day Best of Turkey Tours. You should join and enjoy your time. Cappadocia and Pamukkale, Ephesus and Hierapolis Ancient City. In the end I want to try to say that if you go Turkey, you will find great things to do and to see, great people, love to talk and enjoy everything like in your country. Recommend to everyone, do not hesitate to go Turkey, it is safe and enjoyable country with the nature, history, human and Turkish food. All the best. 8 Day Best of Turkey Tours; i liked all the place during the package, we viseted. Everything was excellent. I will recommend your service to everyone i know. All the best. 8 Day Best of Turkey Tours, we have had the best of turkey tour which covers the excellent sites to visit, I highly recommend to everyone. 8 Day Best of Turkey Tours, me and my family we have spent great time in Turkey, everything was pefect as we wanted. Thanks to everyone who helped us to have such a great holiday in Turkey. 8 Day Best of Turkey Tours, we enjoyed everything and every important thing to visit in Turkey. It was with a great tour and guided service. Thanks to everyone. I will recommend your service. 8 Day Best of Turkey Tours was excellent. Thanks. Turkey Tour Package, best of turkey tour is going to end, today is our last day in Turkey and before ended up, i wanted to leave a note, everything was excellent, i wanted to spend more time in Turkey. 8 Day Best of Turkey Tours was the best option in between offers for Turkey. Highly recommend to everyone. We nejoyed and spent great time. 8 Day Best of Turkey Tours is best tour package which covers the most important sites. 8 Day Best of Turkey Tours was a great tour package for Turkey, we visited everything we wanted. The services of hotel, tours, transportation, guiding, lunch during the tours were great. Thanks to everyone who helped us for this unforgetable holiday, especially tour guides, were knowledgeable and friendly. 8 Day Best of Turkey Tours, we have joined because it was covered most of the sites that we wanted to visit in Turkey and had a recommandation about their service. After we joined and done the tour, recommend their service which was excellent and also place everyone should visit in a life. If you think to go Turkey and have short time. 8 Day Best of Turkey Tours is excellent and you will visit the most of the beautiful sites. Just join and enjoy your holiday in Turkey. 8 Day Best of Turkey Tours was excellent, thanks for your kindly helps, we are happy. 8 Day Best of Turkey Tours, we have spent great time during the our holiday in Turkey with the 8 Day Best of Turkey Tours packages. I highly recommend to everyone to go those sites if thinking to go Turkey. Everything was arranged well and we just enjoyed the our time in Istanbul and Cappadocia. Harika bir tatil oldu, herkese tavsiye ederim, ben ve arkadaşlarım güzel zaman geçirdik. Excellent. 8 Day Best of Turkey Tours is an excellent package to see the nature and history in Turkey. Thanks to everyone who helped us to have such a pleasure in Turkey. All the best. 8 Day Best of Turkey Tours, it was great, we have visited everything we want to visit in Turkey. Wonderful time in Turkey, we spent with the 8 Day Best of Turkey Tours package. Everything was excellent during the our turkey tours, we enjoyed lots of history and natural sites, sea, and walking in Turkey. It was excellent holiday for us. I recommend it to everyone. Turkey tours was great, we enjoyed the 8 Day Best of Turkey Tours and visited the great sites for history and nature. I highly recommend the service of allturkeytours.net. It is a MUST DO in Turkey. Me and my family we have spent great time in Turkey. Turkey is a great country, i mostly liked the locals are sooo friendly and helpful, I highly recommend this 8 Day Best of Turkey Tours to discover the history, nature and have time to talk to locals and get great experiences and great holiday in Turkey. Excellent service and great holiday in Turkey, we have done 8 Day Best of Turkey Tours of allturkeytours.net. Everything was excellent, thank to everyone. I will recommend your service. We have had the Best of Turkey Tours last ween in Turkey, started at the airport in Istanbul and continue to city tours in Istanbul and then Cappadocia, Ephesus, Pamukkale amazing sites with excellent booking. We enjoyed the everything everyday, especially tour guides were great and knowledgeable that we have had amazing tours each day. Everything was on time, Thank for all your helps. We will recommend your service for turkey tours. 8 Day Best of Turkey Tour was great to discover Turkey. We have enjoyed the everything during the our holiday. 8 Day Best of Turkey Tour package we visited the city of Istanbul, Cappadocia. 8 Day Best of Turkey Tour was started at the airport on time, the tours pick ups were on time with the great service and knowledgeable. I highly recommend to everyone. Thank you very much! It was beautiful, comfortable and interesting turkey tours of Istanbul, ephesus, pamukkale and cappadocia, we enjoyed everything and we will recommend you and return to turkey again. I love Turkey. Thanks to everyone that we have great time and holiday in Turkey. I mostly liked the cappadocia part of our package. Everything was the best as the tour. Tour guides, Hotels, Service were excellent. I will send rest of my family. Thanks. We enjoyed Turkey with the great service of the best of turkey tours package. I want to thank to mr. senol who helped us for our turkey tours arrangements and made us excellent touring service for our holiday in Turkey. The hotels were perfect and guides were excellent. We have had an excellent informative service. All the best. It was kind of gift for me to make the travel plan to Turkey for my family, we didnt have long time and i wanted to make the best of Turkey, while searching in internet, found the 8 Day Best of Turkey Tour which was covered the most beautiful sites. I told by parents and booked it. It was very nice. thanks that everything was excellent and my parents happy with the choise ( :))) ). Thanks for all your helps. All the best. It was first time with my wife in Turkey and we have spent great time during the our visiting. Everything was excellent. We booked 8 Day Best of Turkey Tour with turkey-tour.net. The company was very professional and replied to all my queries. Our guides were excellent - we couldn't thank Them enough. They were very thorough and well spoken in his explanations and his knowledge of ancient worlds and nature were fantastic!! Worth every cent. 8 Day Best of Turkey Tour we used the the package for Turkey, it was great. Thanks. One of my friend recommended us to make the 8 Day Best of Turkey Tour in Turkey. We went to turkey with the package of 8 Day Best of Turkey Tour and visit the sites that we wanted to visit with well arrangements, great hotels and got the great experiences about the history and nature in Turkey. I highly recommend this package. We joined a wonderful 8 Day Best of Turkey Tour arranged by allturkeytours.net which covers the the major historical sites in Istanbul, Cappadocia, Ephesus and Pamukkale. The knowledge of tour guide made the great informative tour for us. Thanks to every one who helped us. I highly recommend this package to everyone. We wer in a memorable travel in Turkey. Me and my girl friend we went to Turkey and have had the 8 Day Best of Turkey Tour. During the our stay in Turkey, every details was as we agreed. Hotels, tours, transportation, guiding was excellent. I highly recommend this package for Turkey. Thanks for your help for our 8 Day Best of Turkey Tour, we enjoyed to travel in Turkey with your arrangement. I will recommend you to all my friends. All the best. 8 Day Best of Turkey Tour package is the best package to visit the best sites in Turkey. 8 Day Best of Turkey Tour is the best tour package to visit the history and nature in Turkey. We have done it with my family, it was great with the touring, guiding, hotels, transportation. I want to thank to Mr. Senol who helped us to have this great time in turkey. I highly recommend his service. We enjoyed the everything during the our visiting in Turkey with the 8 Day Best of Turkey Tour. Thanks to every body who helped us for this great time. 8 Day Best of Turkey Tour which we have had in Turkey to travel to visit the historical and natural sites. We have great service and made our holiday with worth and discover what we wanted in Turkey. I highly recommend the 8 Day Best of Turkey Tour to everyone if you think about Turkey. 8 Day Best of Turkey Tour was our best in travel, we had great time in Turkey and injoyed the everything with a very professional service. I highly recommend this tour package to everyone if you are thinking to go Turkey. Turkey is beautiful country and there are lots of to discover in each city in Turkey. Best of Turkey covers the most important sites that i highly recommend it to everyone, private or regular that you can make. I had private 8 Day Best of Turkey Tour which was amazing. Best of Turkey tour was excellent. Me and my family, have had the 8 Day Best of Turkey Tour in Turkey. Firstly, we had great deal from allturkeytours.net (Mr. Senol helped us). we had a excellent week in Turkey and visited the everything we wanted in Istanbul, capadocia, ephesus and pamukkale. We were with the tour guides in each site was with diffrent tour guides, (we joined to groups), tour guides were knowledgeable and we had time to ask our questions, wonders, had time to take pictures of the sites, (the group was 9 person without us). I mostly liked the hotel in Cappadocia , Gamirasu was excellent cave hotel, in Kusadasi and Istanbul we used the 4 star hotels they were nice but, the cappadocia one was special. I highly recommend 8 days best of turkey tour to every one. We enjoyed, i wish you enjoy as well. 8 Day Best of Turkey Tour was included the Istanbul, Cappadocia, Ephesus, Pamukkale which are the sites that we wanted to visit in Turkey. 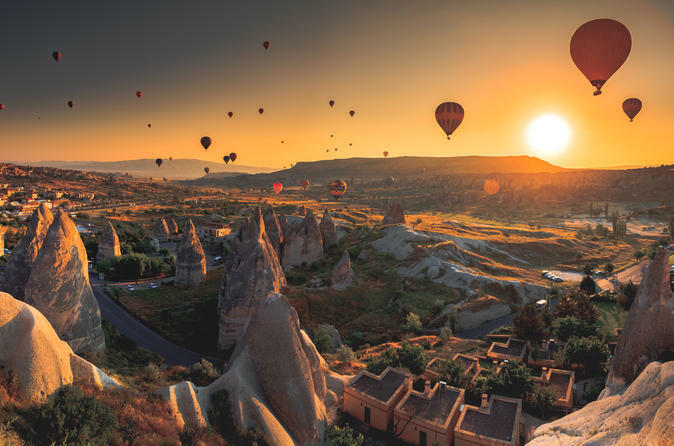 Me and my family, enjoyed the history, nature and done the balloon ride in Cappadocia, used the cave hotel in Cappadocia and 4 star hotels in Istanbul and Kusadasi. The service of 8 Day Best of Turkey Tour was excellent with pick up, drop off, transportation, hotel, guiding and sightseeing. I highly recommend it. 8 Day Best of Turkey Tour, Thank to everyone who helped us to have excellent days which we needed this in our holiday. Especially, mr. senol who arranged and recommend us which hotel and what to do during the free time and nights. At the end of the tour, we were happy and relaxed. 8 Day Best of Turkey Tour, great time for us to visit Turkey and enjoy the everything during the our travel in Turkey. Our 8 day best of turkey was started with our arrival airport transfer in Istanbul, when we landed at the Ataturk Airport in Istanbul, the staff of campany was waiting for us when we exit the pasport gate, they were keeping the our names and then they took us to our hotel from the sea side which was great to see the sea and history together and clean city. The way from airport to hotel was short but there was traffic and took little bit more then hour, the hotel was great, we used the dosso dossi hotel in old city. Staff very friendly and helpful. We didnt stay at the hotel after check in. We went out and walk in the old city, it was great and we had dinner in a local restaurants. I highly recommend it. Next day of our best of turkey tour was our second day and we visited the historical museums and monuments with a knowledgeable tour guide thanks to him that gave us excellent information and answered to all our questions. The group was small and we had time to ask our questions and took photos of the places one by one. During the our visiting in Istanbul i mostly liked the Bosphorus boat trip which was amazing. After ended up our tours in Istanbul, we went to Cappadocia, Cappadocia is beautiful site and EVERYONE SHOULD VISIT it. I hightly recommend and also I recommend hot air balloon in Cappadocia, you should do that as well. We used the Gamirasu Hotel in Cappadocia wis was cave hotel and amazing, Cappadocia was great with all the service. After Cappadocia we continue to Ephesus and Pamukkale, which are an other sites to find the experiences and every traveller talking about. I mostly like the Ephesus and the ruins of it with the library and in Pamukkale, I liked the mineral water swimming pool in hearapolis ancient city. While visiting, Ephesus and Pamukkale, we spent our nights in Efeboutique Hotel in Kusadasi. It was an other nice hotel excellent location to go out and walk around. After Pamukkale we returned to Istanbul, we met Mr. Senol who was arranged everything for us to thank him for everything, before we fly home. 8 Day Best of Turkey Tour was our best travel time in Turkey, we were 5 girld and enjoyed the travel in Turkey. Thanks. 8 Day Best of Turkey Tour was well arranged, everything went smoothly and we had great experiences about the history and nature. The hotels which we used was excellent, thanks to every one who helped us to have unforgetable travel with the 8 Day Best of Turkey Tour in Turkey. I highly recommend this tour to make excellent travel in Turkey. It was worth for money and we had spent great time. I have had the best of turkey tour, 2 weeks ago, everything was great during the tours and staying at the hotels in each site, I highly recommend this package to every one. I think, it is better to make this package during the summer. I do it in winter and Turkey was cold. Anyhow, if you think to go Turkey, do this package to see the everything in a week and little bite more. 8 Day Best of Turkey Tour was our first time and our anniversary for our marriage in Turkey. We wanted to make the best turkey tour and visit the best places in Turkey. We checked the internet and found the turkey-tour.net and best of turkey tour which covers the sites that we wanted to visit in Turkey. Best Turkey Tour package we were looking for. I would not recommend to every one 8 Day Best of Turkey Tour in Turkey. Firstly we visited Istanbul with its beauty and continue to cappadocia for 2 more day tours in Cappadocia which was part of the best of turkey tour and then continue to Ephesus to join to the another sites to visit. Ephesus and Pamukkale for the ancient city of Ephesus and Hierapolis. Cappadocia tours was all natural sites during the our best of turkey tour, mostly natural sites in Cappadocia. Ephesus and Pamukkale was the historical ancient world site. Istanbul was museums and meeting with locals, the other sites we met with locals but istanbul is more crowded city and more local it means. We used the great hotels in Istanbul, Cappadocia and Kusadasi during the best of turkey tour. We used the dosso dossi hotel in Istanbul, Gamirasu Cave Hotel in Cappadocia and Charisma Hotel in Kusadasi. We made the tour of Historical museum, monuments and ruins 6 days long in Turkey and used the flight as a transportation from city to city by turkish airline which was nice. During the tours, we used the minivan. During the tours, we had touring for the sites with the knowledgeable and friendly tour guides and driver and joined to small groups in each site. It was excellent to be in a small group and found time to talk to tour guide personally. If you will ask, which site you recommend as a part of your tour, I will recommend you everything do not divide the package and do not miss the places. Make your best of Turkey tour with the turkey-tour.net and get your own excellent experiences. It will be great and my recommendation. Thank to everyone who helped us for your turkey tour, we had excellent holiday in Turkey. We booked our turkey tour from here, we wanted to make best of turkey tour and after we checked the best of turkey tour and had some recommendation about where to visit in Turkey. We dicided to book this best of turkey tour. Recommend it as well. We enjoyed our 8 Day Best of Turkey Tour in our holiday in Turkey. I highly recommend this 8 Day Best of Turkey Tour to every one. Turkey is a great county to visit for culture, history, nature and to spend a holiday. I have had the 8 Day Best of Turkey Tour and visited the Istanbul, Cappadocia, Ephesus and Pamukkale which was fully with the history, nature and culture. I mostly liked the cappadocia which was keeping the nature and history together. If you go Turkey and even you have short time go to Cappadocia. I highly recommend. We signed up for 8 Day Best of Turkey Tour with the turkey tour net. We started upon landing at the ataturk airport in Istanbul and ended up at the ataturk airport on the day 8 of 8 Day Best of Turkey Tour. We made the visiting, sightseeing tours of Istanbul, Cappadocia, Ephesus, Pamukkale with the guiseds who were all informative and knowledgeable, kind, we used the hotels were nice in Istanbul, Cappadocia and Kusadasi for our accommodation. At the end of the our experiences, i highly recommend this 8 Day Best of Turkey Tour to every one who likes to visit Turkey. I want to expelain everything during the 8 Day Best of Turkey Tour in Turkey which we had as an experiences, but it is long as you see it is 8 days, because of the I will cut most of the thing and tell you that is fabulous package of Turkey, which covers the most touristical and important sites to visit in Turkey. If you think to go Turkey, do not stop your self and join to the 8 Day Best of Turkey Tour and have your great experiences. All the best. We had discovered the Turkey, It was great with all the service. 8 Day Best of Turkey Tour took us to history, nature and gave us time to talk to locals. We used the great hotel in Cappadocia, Istanbul and Kusadasi. We liked the everything during the 8 Day Best of Turkey Tour, i highly recommend this service and tour package if you think about Turkey. Our Turkey tour which had done was excellent, we had great experiences about the history, nature, culture, locals in Turkey. I wanted to go Turkey always when I knew with the its history and people. Turkey tour was recommended to me one of my friend who had done the Cappadocia, Ephesus, Pamukkale and Istanbul then me and my girlfriend decided to go Turkey for a week and started look at it. Checked the google and found the turkey-tour.net which was one day more but was good. I check the reviews of the tour, and sent an e-mail to have infor for the condition of booking, payment of our package. They were replied quickly with all the answers and online secure payment link, it was so easy that with one e-mail, I got the details and payment conditions Anyhow I want to tell about the turkey tour and service. The Turkey tour was great with all the service. We started to the tour upon landed in Istanbul Ataturk Airport. The staff took us to our hotel in Istanbul (Dosso Dossi hotel located in old city which was excellent). We stayed in Delaxe hotel. The starff was very kind and friendly I highly recommend the hotel. Our first day tour was for the historical sites in Istanbul, we discovered the St. Sophia Blue mosque and other all the place. it was a full day one which we spend in Istanbul. Our second day tour for the bosphorus boat tour we visited the sites and made about 2 hours boat sightseeing from the port to second bridge of Istanbul, it was a great day. Then we went to Cappadocia, for 2 day, Pamukkale for 1 day, Ephesus for 1 day, 4 days long we visited the history, nature, ancient cities, calcium terraces, nature in Cappadocia. Excellent experiences we have got. I highly recommend those tours. We also had hot air balloon in Cappadocia. It was early in the morning. The morning in Cappadocia was amazing to have this experiences and watch the horizon from the balloon. Hotel in Cappadocia was Gamirasu which was fabulous and in Kusadasi, it was Kismet Hotel, I highly recommend those both hotels as well. At the end of the turkey tour, we want to live in Turkey but our life was waiting for us in USA. I want to thank to Mr. Senol who helped us for the booking and arranging our package. I want to thank to all tour guides that they gave us unforgetable tours and experiences about the sites. The staff of the transportation in each city we felt safe with the cars and driving in Istanbul, it is so busy city, Cappadocia, Ephesus and Pamukkale transportaiton and driving was long. At the end of the my review, I hilghly recommend this package to every one.. Do not hesitate to make. Best of Turkey tour, we had done and with the best of turkey tour in Turkey, we spent 8 days and had fun, culture, history and met with very nice local and other visiter. It was excellent time for us. All the best. Best of Turkey tour were very comfortable, with the nice hotel to stay in Istanbul, Cappadocia and Kusadasi, tours were informative and must do in Turkey for the culture and history, transportation was with the turkey airline and great, land transportation was excellent. I want to thank to our tour guides of Ephesus, Pamukkale, Cappadocia and Istanbul. At the end I want to recommend this tour to every one. I recommend turkey-net to any one who want to make the best of turkey tour and visit Istanbul, Cappadocia, Ephesus, Pamukkale. I have done package, it was well arranged for the transportation, hotels, tours. Everything were amazing, well planned, and fun. The guides are professional n helpful. 8 Day Best of Turkey Tour, I want to make the this tour package, if possible, I want it 10 days with 2 more free day in Istanbul, tell me price and details. My Wife and I enjoyed the best of turkey tour which was coversed themajor historical sites in Istanbul, Cappadocia, Ephesus and Pamukkale. We had the experiences about the history and nature in Turkey. The service was excellent. I recommend this experience for any visitor to Istanbul. Me and my family, we had done the 8 days Best of Turkey Tour, visited istanbul, Cappadocia, Ephesus, Pamukkale with the great and knowledgeable tour guides, I want to thank them, please inform them. Again thank you Mr. Senol beeing kind and arranged us unforgetable holiday in Turkey. I want to inform you that one of my friend is coming to Istanbul, he wants to book with you, same tour, same details. All the best. I had an excellent8 Day Best of Turkey Tour in Turkey with the turkey-tour.net. Mr. Cuneyt arranged our best of turkey tour package which we had been in Istanbul, Cappadocia, Ephesus, Pamukkale. The Service was excellent from beginning to end of the our 8 days, we started from the Attaturk airport and ended up at the Atatutrk airport in Istanbul. We had 6 Days tour in Turkey for Istanbul 2 Day full day, in Cappadocia 2 full day and 1 full day in Pamukkale and 1 full day in Ephesus and also we had hot air balloon ride in Cappadocia with it we had 7 different service nearby this airport transfers, hotels, guiding, local lunches everything was perfect. Actually, Turkey is excellent by it-self. I highly recommend this organization to every one. We had 8 great day in turkey, thank you very much for recommending the 8 day best of Turkey tour. Everyone during the tour is here, it is good to see this. I highly recommend this 8 day best of Turkey tour as every one. After reading reviews of different tour companies in Turkey, we decided to go with All Turkey Tours and were so happy. We had great time and tour service with the incredibly knowledgeable tour guides in Istanbul, Ephesus, Pamukkale and Cappadocia. With the 8 days best of turkey tour we have got the in-depth history of each site, was extremely gracious and kind, and genuinely cared for our well-being the entire time we were in Turkey. we were in Istanbul during the recent bombing which was happened in our last day in Istanbul, it is not hepped in Istanbul as its in the world. I want to return to our holiday because it was most beautiful holiday of ours, it should not be happened such a thing in Istanbul, Turkey, and it it is, it should not be stoped you. Because it is hepping all around the world. I highly recommend this to make this tour in Turkey. We booked the best of Turkey Tour and made the privately, and our guides were great, we have different tour guides in Istanbul, Cappadocia, Ephesus and Pamukkale all they were excellent and knowledgeable. The company was very professional and replied to all my queries with the answers of what we wanted. Thanks to all tour guides for well spoken explanations and nowledge!!! As it was a private tour we were allowed to make our own pace and it enabled us to spend longer at some points or shorter at others. I highly recommend this best of turkey tour. 8 Day Best of Turkey Tour was with the great service. We enjoyed the our holiday in Turkey, I highly recommended to every one. Turkey tour was excellent, thank you very much for serving us great service and unforgetable holiday in Turkey with the 8 Day Best of Turkey Tour. Thank you. I visited Turkey with my family with package of 8 day best of turkey tour and had an excellent experience. After some research foun the turkey-tour.net At every level of this tour from start to end, the service was perfect with the tour, transfers, hotels, pick up, drop offs in Istanbul, Capadoccia, Ephesus, and Pammukale, learned a lot of new things and at the same time we had fun and enjoy every moment of this interesting and magic country. I highly recommend thise 8 day best of turkey tour. Turkey tour which had done the best of turkey tour. We had visited the cities of Istanbul, Cappadocia, Ephesus and Pamukkale which was fabulous. Recommended as a turkey tour. Actually, our best of turkey tour was really best of turkey, because of arrangements, history and culture are all together during our visiting and we have got the best experiences and the excellent experiences about turkey with the 8 days best of turkey tour. 8 Day Best of Turkey Tour was excellent we done in Turkey. It was a great tour package, as we agreed about the details, hotels, pick up, drop offs, everything was on time. We joined and enjeyed and was taken care of and our guides were excellent. Great local knowledge and passion for their job. Fantastic food recommendations! The tour ran like clockwork. I highly recommend. An excellent 8 day tours in Turkey with the great tour guides, hotels and touring also transportation. We would thoroughly recommend this 8 day best of turkey tour. Well arranged, informative tours. I and family and I travel to Turkey and done the 8 Day Best of Turkey Tour. We visited the historical and natural sites in Turkey, 8 days long we enjoyed the our reservation and hotels, everything was so close to be perfect, We were with the knowledgeable and friendly tour guides during the tours of 8 Day Best of Turkey Tour, and great staff at the hotels helped us for all our needs and we spent the time as we want which was awesome! I think is the best package to visit the everything and enjoy the holiday. I booked it because of its name, but it is much better then its name with the right agent. We booked our turkey holiday with this company and made the 8 Day Best of Turkey Tour, we started at the Ataturk Airport in Istanbul, and had a fabulous informative tour of Turkey with the 8 Day Best of Turkey Tour. Saw everything we were promised and more. Our guides, even helped us negotiate our deals. We have had a great time with this company. They reply every email quickly and offer great ideas. I highly recommend this company, make your booking and Enjoy the rest. 8 Day Best of Turkey Tour is really best tur in Turkey with its service and tours guides and also hotels and transportation, they helped us to book everything for 8 Days in Turkey. We started in Istanbul and ended up our tour in Istanbul. From beginning to end of the package, we met people from different country and locals, got the experiences of the historical sites and spent excellent time in our holiday in Turkey. 8 Days of Turkey best tour organised was real professional we endjoid everything and every details of the 8 Days of Turkey best tour right from arrival at Istanbul till departure was very well taken care of. Thanks for all your helps. Our best of turkey tour was amazing! it was informative, very knowledgeable and easy to understand we had an excellent holiday in Turkey. It was just one day longer then a week in turkey with the 8 Day Best of Turkey Tour, we enjoyed the most of the historical sites and had great experiences about the turkey and its history. I liked to have time to talk locals during the tours and after the tour, we went to dinner to local restaurants, they were so friendly. It was nice to go out and have dinner in each site, because every city has different meals. 8 Day Best of Turkey Tour, which i had done in turkey while planning for 3-days visit to Cappadocia, I was fortunate to come into contact with Mr. Senol in BeHappyTravel. He helped me in finalizing detail of my trip and provided me all services that were agreed. We have enjoyed the all organization and visiting in Turkey. 8 Days Best of Turkey Tour was unforgettable for us. Great service, thank you very much for all your help for booking and having great service. It was a great time which we spent in Tukey Tour. We visit Istanbul Cappadocia with 8 day Turkey Tour. Great time and value. Me and my wife we went to Turkey tour for 8 day. We started from Istanbul to our turkey tour it was great, upon arrival turkey tour's employer was waitng us, by holding our names and we got closer and said that it is our names, then took us to transportation vehicle it was mini -van great, driving was safety and slow, there was a traffic on the way but the view was excellent of sea side of Istanbul, untill hotel, hotel also was very nice and good location in old city of Istanbul (Sultanahmet) then next day we started to our turkey tours, for pick up and drop off hotel was on time and tourin in Istanbul were fantastic, we visited many place and most touristic attractions and then fly to Izmir it was by tukish airline, it was nice, Ephesus and Hierapolis Ancient cities were great with their ruins and history, Cappadocia, we went from Pamukkale to Cappadocia after visiting the Hierapolis. Cappadocia was excellent included 2 day tour in Cappadocia. At the end we returned to Istanbul before depart home. All the organization of the Turkey tour was excellent. We had visit in a week every touristic attractions, I recommend Turkey Tour. This package is a MUST SEE in Turkey. Excellent service and touring in Turkey. Great value for the money. We went to Turkey with the 8 days tour service. We visited the historical centers. Our tour guid was excellent. Touring was great for each site. Recommend this tour. Our day in Turkey was started at the airport in Istanbul, meeting was on time. After met at the airport everything went smoothly untill the end of the tour. 8 day in Turkey was excellent. Recommend. We visited the ruins and have time to talk to locak and get cultural exchange, it was incredibly moving days and also with the guide tours, we learnt more then we thought from turkey. We have genuine interest and fascination with the topics, ı recommend recomend those days every one should have those experiences. I went to Turkey and had done 8 Day Turkey Tours, Istanbul, Cappadocia, Ephesus, Pamukkale historical and natural sites. The tour was excellent. I mostly liked the Cappadocia with its history and nature. The tour group was small and touring with the small group was excellent. Turkey Tour package we wend 8 days wonders of Turkey tour which was great with its all service such as hotel pick up, drop off, english speaking tour guide, lunch, museum fees, guiding, airport transportation. Our tour guide Mr. Mehmet was excellent during the tour of Cappadocia, Miss, Melis in Ephesus and Pamukkale, Mr. Aydın in Istanbul. Thanks to all of them. I recommend this tour. I went to Turkey for 8 day and had done turkey tour for the most important sites. Turkey Tour was excellent from beginning to end with all the services with hotel pick up, drop off, guiding, transportation. I recommend this tour to every one. Me and my family, we had done the private Ephesus and Pamukkale Tour from Istanbul for a day by flight, in the beginning, we started very early in the morning from Istanbul before the sunrise, and arrive in Izmir then continue to Ephesus Ancient city to visit the ruins and then we continued to Virgin Mary House, after visiting the House of Virgin Mary, we also had time to pray. Then drive to Pamukkale on the way, before arrive in Pamukkale, we had a beautiful lunch on the way in a local restaurant. After arrival in Pamukkale, we visited the Hierapolis Ancient city and Calcium Terraces which was fabulous, I recommend this tour to every one. After finished our touring in Pamukkale continue to airport in Denizli to fly back to Istanbul. It was about 22pm we arrived hotel in Istanbul. I went to the gallipoli battlefields tour, it was informative and nice touring for the each sites. Everyone should visit the battlefields to understand the war there. How long from Istanbul to Ephesus? Is it possible to get in a day from Istanbul to Ephesus and join to the Ephesus then return to Istanbul. It was good experience about the battlefields in Gallipoli Peninsula, i recommend this tour to everyone. One of my friend recommend your reservice and price, i want to make the best of turkey tour with you but I want to know is it possible to make it little bet cheaper? In my holiday, ı have done the 8 day best of Turkey tour package and visited the everything that I want to visit. I had also recommendation to visit the Cappadocia, Ephesus, Pamukkale and Istanbul in Turkey. It was excellent that in 8 day, I have done it and have great experiences about the history and nature and also local people in Turkey. Everything was great.